This IELTS process exercise is a gap fill, which will hone your skills for the test. Process diagrams appear less often in the IELTS writing task 1, but they are sometimes there so you need to be prepared if you do get one. The most important part of it is being able to use the passive. 1) The passive is used for processes because the focus is on the action, not the person doing it. So the object is made the subject. Active = John takes the dog (object) for a walk every morning. Passive = The dog (subject) is taken for a walk every morning. The staff arrive at 8.30 am. Turn the verb you are given into the passive - if appropriate! (remember intransitive verbs cannot be passive!). Don't forget subject verb agreement. Type in small letters and do not leave a space after the last word (this will make the computer mark it as wrong). The water (to heat + then) .......... to 100 degrees. The water is then heated to 100 degrees. 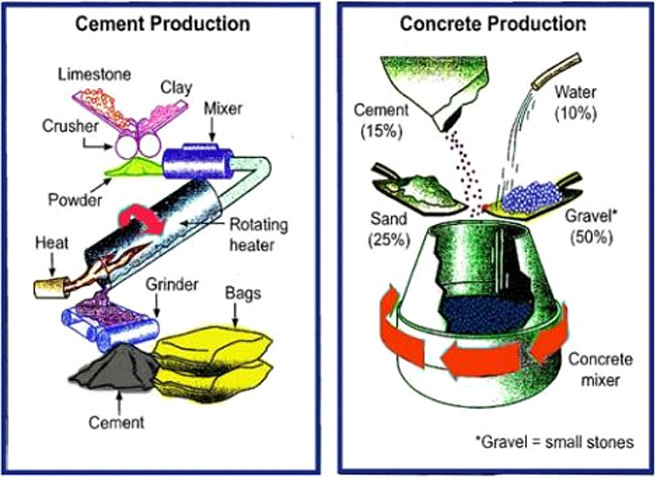 The diagrams explain the processes of producing cement and concrete. Overall, there are five stages for making the cement and one for the concrete. The cement must (1. to make) first, as it (2. to use) to make the concrete. To make cement, firstly limestone and clay (3. to feed) into two rollers which (4. to crush) them up into a powder. This power (5. to mix + then) together, before (6. to travel) down a tube and into a rotating heater. The heat comes up from the bottom as the heater rotates, and once the power is ready, it (7. to emerge) from this machine onto a conveyor belt where it (8. to grind + then) into the cement. Finally it (9. to separate) into bags. This cement is then used to produce the concrete. To do this, there is a mixture of 15 per cent cement, 10 per cent water, 25 per cent sand and 50 per cent gravel. These (10. to place) into a concrete mixer, which spins in order to form the concrete. Let's just go through some of the answers to the IELTS process exercise in case you did not understand them. (to make) be made - 'must' is a modal verb, so the verb 'to be' is in the infinitive. (to feed) are fed - there are 2 subjects so the plural verb is used. (to mix + then) is then mixed. (to travel) travelling - travel is intransitive, also as it follows 'before', it takes the -ing form. (to emerge) emerges - emerge is intransitive. (to place) are placed - plural verb to agree with 'these'.